Yesterday, my day off, I get a call at home from the bank where I work. 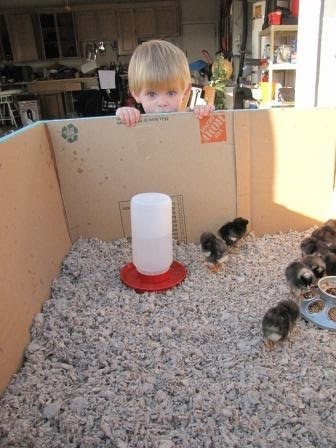 My co-worker calls my cell phone and says, "Um Justin, you have some chicks waiting for you here!" 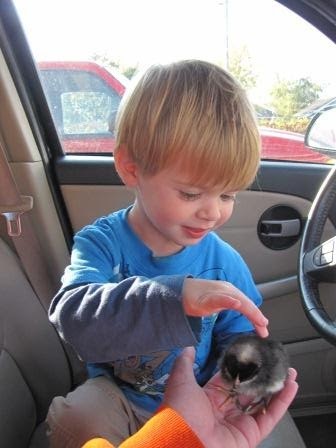 Yes I had 10 live Plymouth Rock chicks delivered to my banking center all the way from the east coast. Why? 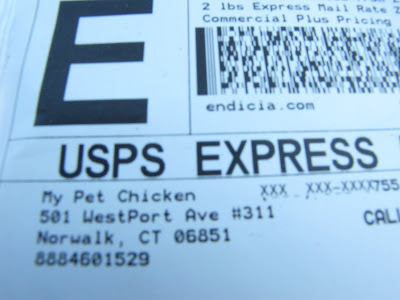 Because it's me and how awesome is it that I live in a town where it's ok to have live poultry delivered to my banking center. Well, it may not be banking center policy to allow these things to happen, but no one has complained yet, so we'll just go with it. 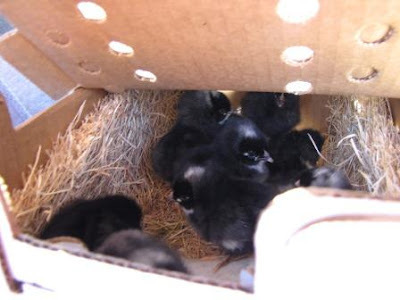 So they showed up to my banking center chirping in their little air mail box and all the bankers and tellers were absolutely thrilled that 10 little chicks paid a special visit. Now you might remember from a previous post, when I was all excited about getting fertilized chicken eggs in the mail. We failed at incubation! We turned those eggs for 25 days three times a day and not one of them hatched. I am not sure what happened exactly. But they were supposed to hatch after 21 days of incubation and they unfortunately did not make it. It was sad as I thought about what I could have done better or different. It might of been that the incubator accidentally went up to 109 degrees Fahrenheit one night, or it might have been that I washed them when I received them and broke the deligate embryo membrane. 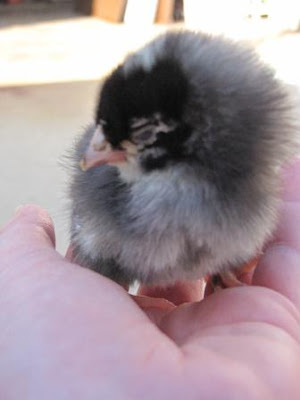 I don't know exactly what went wrong, but I wanted to get my chicken venture going, so I paid $2 more and got ones that were already living. To me that sounds like a better deal! So if you are city folk raised like Beck and I, you might be thinking if 10 chicks showed up at my door I wouldn't know what the heck to do! 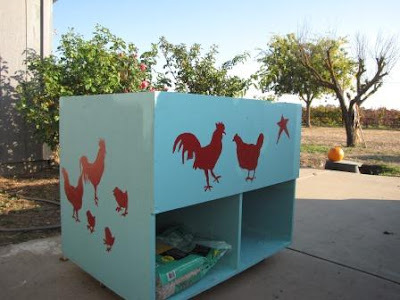 Well, the 21st century is a beautiful thing as we have books like "How to raise chickens?" and blogs like "My Pet Chicken" and "Backyard Chicken" and Google Search to keep us on track. Things like the internet and social media allow city folk like us to get a quick education on how to be good chicken farmers on the fly! This was a rolling shelving unit that was left in the garage when we bought the house. 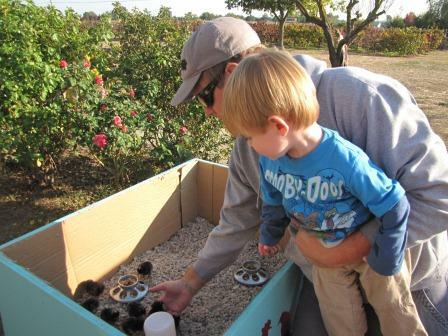 My Dad and I converted it into a chick brooder. I painted the brooder blue and freehand painted the red chickens and chicks. Through this project I found out that I can be an artist when I want to be! This will be the chicks new home for 4 to 5 weeks and then my Dad and I will be creating their permanent chicken coop outside. 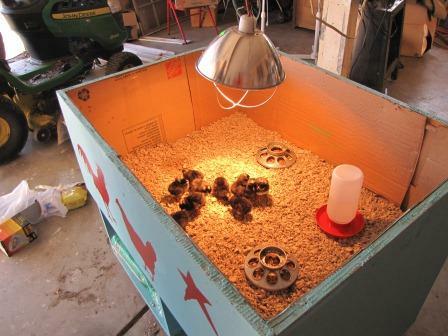 These two pictures below show what these chicks will look like when they are 4 to 6 months old. The first picture is a rooster and the second picture is a hen. According to the website Backyardchicken.com "The Plymouth Rock originated in New England in the 19th Century and was first recognized as a breed in the year 1869. 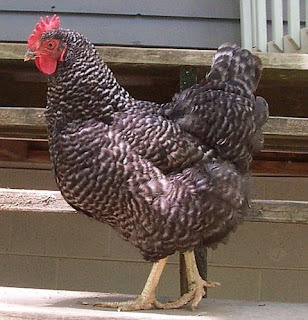 Farmers created the first Plymouth Rock chicken by using breeds such as Dominique and Dorking Couchins. 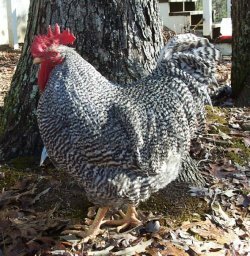 The breed brings value to the farmer through it's hardiness (it can take the cold and heat), egg laying, broodiness (reproduction) and meat productions." Also please note that the feathers on the rooster feathers currently retail for $10 a pop in salons and wholesale for $1.50. However as Beck mentioned to me tonight, by the time these chickens will be ready to harvest, that fad will probably be long gone! None the less, in my typical optimistic dreams....you never know! this is fantastic man! im stoked your totally getting into all of this! soon you wont even have to buy eggs! YEW! Aww thanks Steph! :) yeah Bran, we're totally stoked about the eggs!